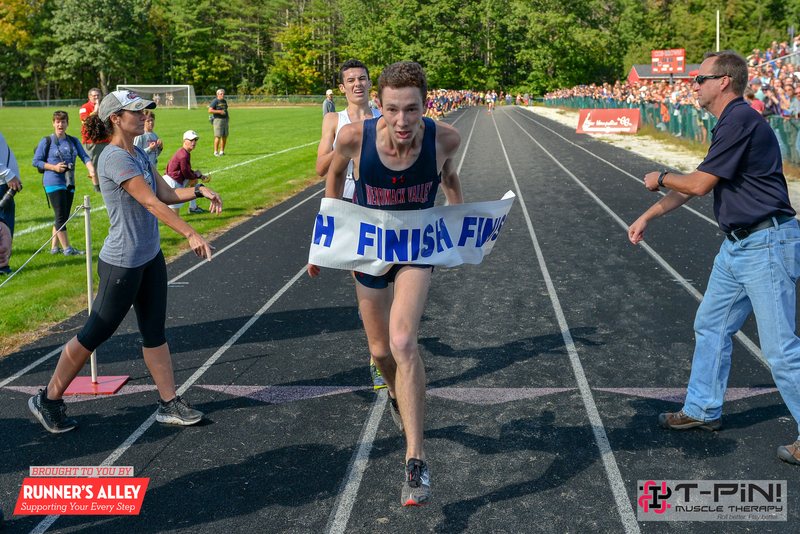 Home » Black Bear » 2018 Black Bear Recap, Results! 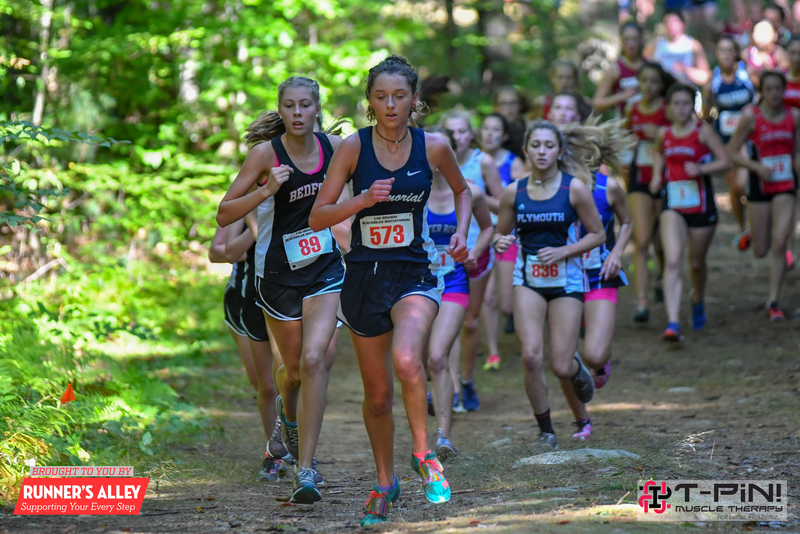 With six ranked teams on the women’s side, plus private school Phillips Exeter and Vermont #1 Champlain Valley on the girls side, and six ranked teams, plus Phillips Exeter and #11 team Hanover on the boys side, the 15th edition of the Black Bear Invitational looked to be one of the best meets of the 2018 cross country season. With essentially the #1 teams from each division and then some, the meet appeared to potentially be a reflection of things to come later in early November when NH’s best meet again for MOCs. 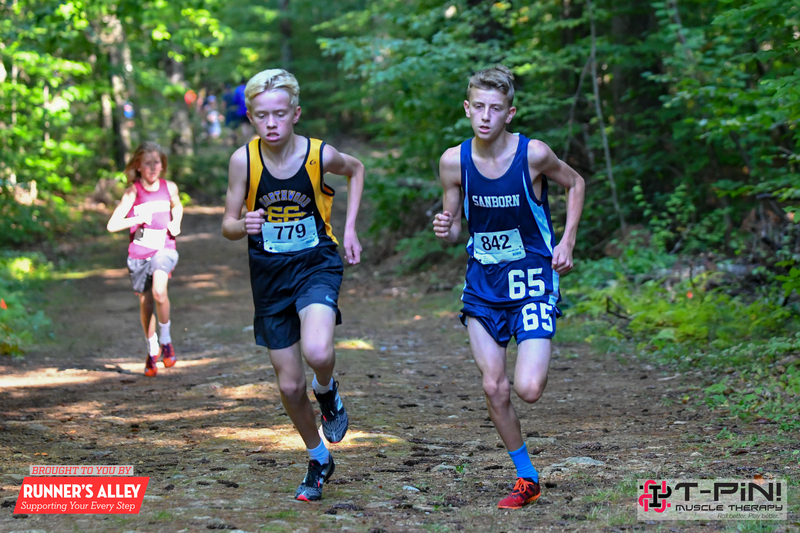 Add in some high quality middle school racing and you’ve got some cross country excitement on a beautiful day in Northwood, NH. 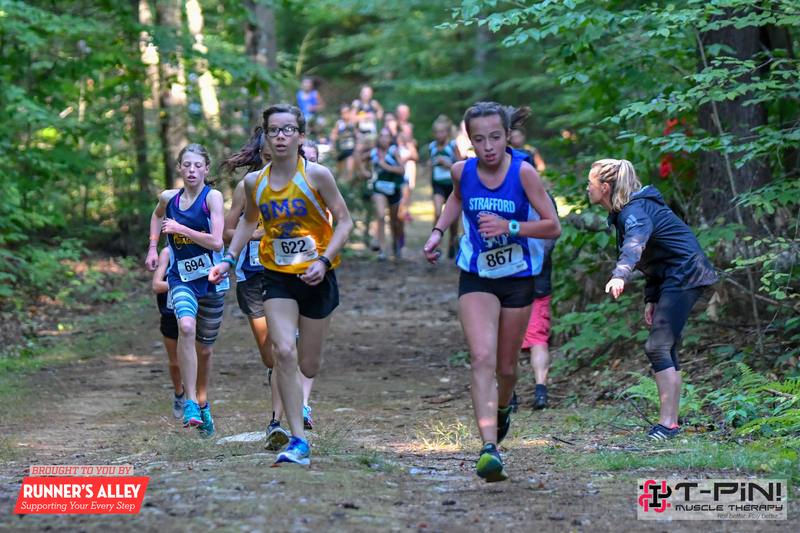 Things got off to a fast start with the girls Middle School race with Strafford School’s Mallory Taylor going straight to the front and never letting off the gas. She would win in 12:22. Following just out of her slipstream was Brianna Malone of Barrington and Haley Kavanaugh of Oyster River, 4 and 11 seconds back. 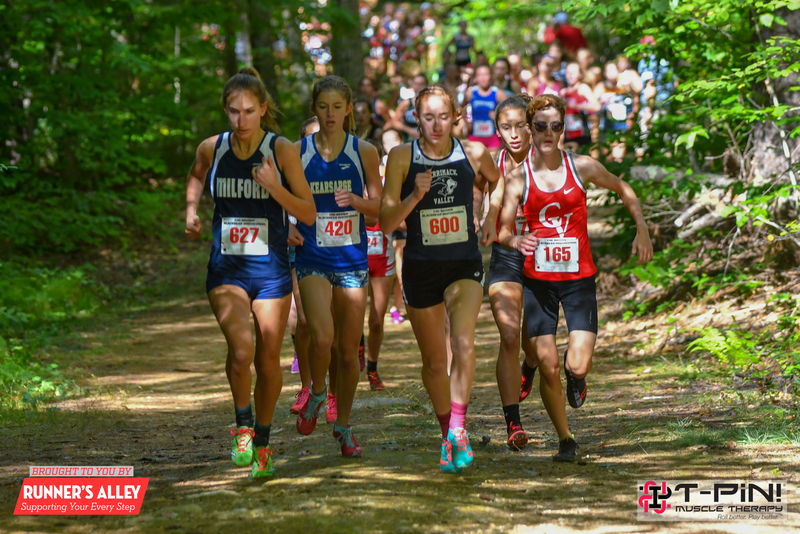 Deerfield would win this one, and while they had no one in the top three, Bella Lemay and Sophie Hopkins would round out the top five and with support from Ava Woodman (18th), Christina Mallette (19th) and Rowan Carr (24th). The Dragons would have enough firepower to best Hillside 63 to 73. Strafford (87), Barrington (109) and Boynton (111) would round out the top five. In the boys race the sparks would fly as Sanborn’s Jared Khalil would run shoulder to shoulder with Northwood’s Aidan Cox. Cox, the course record holder and two time D3 champ on this course set a strong pace up front, working hard to lose Khalil in the single track. Cox managed to grab a little daylight just before the track but Khalil proved to have a stronger finishing kick, winning 10:16 to 10:18, seconds off the course record. Rounding out the boys top five about a minute back would be Portsmouth’s Avery Crowell, Tyson Khalil of Sanborn and Tyler Tkaczyk of Northwood. Deerfield would win this one as well, 59 to 80 over Sanborn. Without anyone in the top ten, the Dragons placed their top five in between 11th place and 21st place for some solid team running with a 46 second pack time. Oyster River would come in third (99), followed by Strafford (134) and Chichester (138). In the Girls JV Race, Memorial’s Madelyn Peterson would jump out to an early lead and by the halfway mark would cement her position at the front. She would run unchallenged from this point, winning by thirty seconds in 22:04. Next in would be CBNA’s Kylee Blad followed by three Oyster River girls, Grace Henry, Addie Berglund and Maggie Keenan. Rounding out the top ten were CBNA’s Olivia Noni, OR’s Zoe Pavlik, Phillip Exeter’s Anika Tsai, Concord’s Serena Britos and Bedford’s Avery Houghton. Oyster River would win this one handily with four in the top ten and the scoring five in the top 16. Phillips Exeter would finish second with 76 points with Coe-Brown right behind with 77 points. Bedford (99) and Concord (111) would round out the top five. The Boys JV Race would be the biggest race of the day, pitting 271 runners against each other. But unlike the girls JV race, the boys would go through multiple lead changes. PE’s Charlie Neuhaus was at the front pushing the pace until just beyond the two mile mark where Concord’s John Murphy took control. Pushing from the front from that point, Murphy was in control and went on to win in 18:10, solid enough to have finished 59th in the Varsity race and 13 seconds ahead of Neuhaus. Winnacunnet’s Ben Merrick was third, PE’s Phillip Horrigan fourth, and Oyster River’s Dillon Labonte wound up fifth. Rounding out the top ten was Aiden Gleason (Concord), Tyler Rose (CBNA), James Liu (PEA), Ben Webb-McClain (Winnacunnet) and Isaac Wells (CBNA). Phillips Exeter would win this one handily 39 to 73 over Concord with their scoring five in the top sixteen. Coe-Brown would finish third with 84 points, Oyster River placed fourth with 86 points, and Winnacunnet was fifth with 88 points. Yep, four points separated the third from fifth place. A battle was brewing in the girls Varsity race, with fab freshman Sophie Reynolds of Merrimack Valley, the duo of Alice Larson and Ella Whitman of Champlain Valley, the trio of Clare Ververka, Rachel Hurley and Schuyler Michalak of ConVal, North’s Adrianna Braccio of North, top PEA runner Gia Pisano, D3 champ Mya Dube, and hometown favorite Addison Cox. These runners formed a strong front pack early in the race with Reynolds at the fore dictating the pace early. As the miles wore on, the pack would thin to Reynolds, Larson and Dube, with Reynolds slowly inching away. Behind the front three, the ConVal girls with working their way towards the front splintering the chase pack. Reynolds would continue to stretch her lead, winning in 18:49, twenty one seconds up on Larson. Dube would finish third (19:16) followed by Whitman ten seconds back. Whitman would be followed by two Con-Val girls, Ververka (19:31) and Hurley (19:32). Braccio (19:40), Michalak (19:45), Cox (19:50) and Pisano (19:54) would round out the top ten. Champlain Valley Union would win this one, marking them as a strong contender for the New England crown in November, with 92 points with their scoring runners all finishing in the top thirty four. Con-Val would take the surprise second spot, marking them contenders for the D2 title, with 141 points, just two points in front of Coe-Brown. Pinkerton (160) and Phillips Exeter (193) would round out the top five. 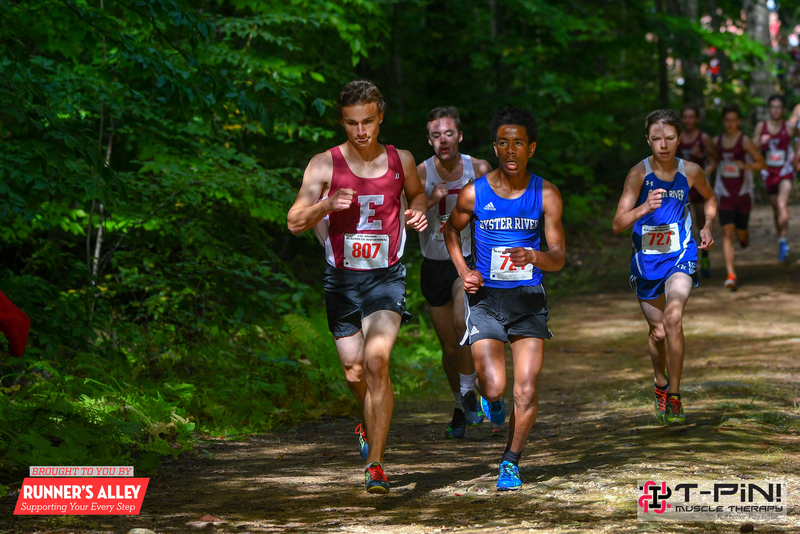 The Varsity Boys Race looked to be a showdown as well as with D1’s #1 in Forest MacKenzie and his side kick Eli Boesch-Dining of Concord were in this one along with D2’s #1 in David Reynolds and D3’s #1 Jeffrey Allen. Add in Phillips Exeter #1 man in William Coogan, along with the guys from Winnacunnet, Mascenic, Coe-Brown and Nashua North, and you’re assured there’s going to be some fantastic racing going down. And when the gun went off, 233 boys took off as if shot out of a cannon, all looking for running room as the field gave way to the wooded trail. The duo of MacKenzie and Boesch-Dining established themselves at the front with Reynolds just off the leaders in the preliminary stages of the race. The big names were lurking in the chase pack, that in the early going was numbering about thirty, indicating that some would be in for a tough second half. As the pack strung out after the mile, Reynolds was up on the Concord duo’s shoulder looking to keep the pace moving. Allen, Coogan, Winnacunnet’s Colin Donnelly, North’s Joseph Curran, Mascenic’s Landen Vaillancourt, Sanborn’s Dylan Khalil, and Coe-Brown’s Luke Tkaczyk and Wyatt Mackey were in hot pursuit. Approaching the single track with just under 1000 meters to go, Reynolds assumed the front position, followed by Boesch-Dining, with MacKenzie trailing by about 7 meters. Allen, Donnelly and Curran were trying to bridge the gap with Vaillancourt putting on a late charge trying to move towards the front. Before the finish, Boesch-Dining was able to open a small gap on Reynolds and looked not only to finish in front of his teammate MacKenzie, but win his first major meet. But Reynolds’ sneaky speed was able to nip Boesch-Dining at the line, both athletes receiving 16:16 for their efforts. MacKenzie would finish twelve seconds back in third, with Donnelly a second back in fourth. Curran (16:36) and Vaillancourt (16:36) would finish neck and neck for fifth and sixth, while Tkaczyk (16:42), Allen (16:44), Khalil (16:44) and Coogan (16:46) rounded out the top ten. Concord would hold on to their #1 ranking in the state, finishing with 62 points and their scoring five in the top 22. Coe-Brown would be next best with 85 points and Winnacunnet placed third with 114 points. Oyster River and Phillips Exeter had to go to the tiebreaker to settle 4th place as both scored 143 points through five scorers. OR’s sixth place finisher would win out give 4th to the Bobcats. With this much excitement at midseason, the fireworks at Meet of Champions (and the rest of the season) will be something to behold. 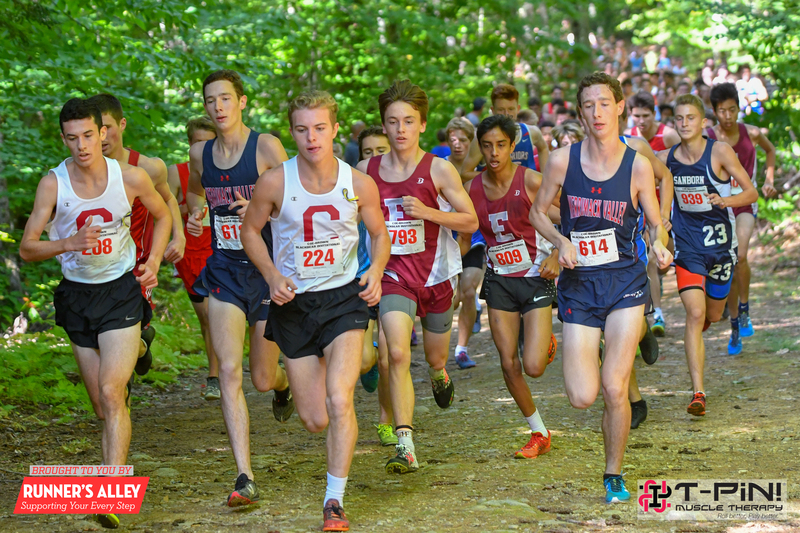 The guys at Coe Brown put on a quality meet that truly resembles the Meet of Champions in many ways with many of the States best teams going head to head halfway through the season. With the MS races and the ability to see the future right before our eyes is a wonderful thing as well. Some very strong performances. Good recap Mike! Nice to see this much coverage from the good folks at NHCC! Next post Mascenic Team Blog Weeks 6 & 7!